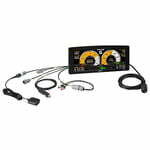 The C1212 Race Logging Kit is a cost-effective, plug-in display and data logging solution based on our new full color C1212 Display Logger. Offering professional level features at a club level price, the kit is quick and easy to connect, requiring no previous experience with MoTeC systems. Each component simply plugs into the professionally wired and terminated loom, which comes complete with a handy plug-in power adaptor. The kit is expandable and can be adapted to suit various applications. The C1212 Display includes a built-in array of 10 programmable, multi-colored LEDs for shift lights and other driver alerts. Numerous selectable layouts supplied, including an RPM sweep, RPM dial and a multi-value style ideal for the dyno or warm up. Each is available in four color variations. (red, green, blue, white) All layouts include a multi-purpose, zero-centred bar graph primarily for Lap Gain/Loss but can be configured for other purposes such as Fuel Level, G-Force (Lat or Long) and Steering Angle. logos, custom icons, tailored screen layouts, creative gauges and more. Supports Wideband Lambda from MoTeC PLMs or LTCs, using Bosch LSU or NTK UEGO 5 wire sensors. Includes i2 Standard Data Analysis software (Pro Analysis version optional). Compatible with E888 and E816 expanders, and providing full functional use. GPS Data and Lap Timing. Professional quality plug-in loom, terminated and labelled, with plug-in power adapter. For sales questions regarding any MoTeC product please call 909.291.7550 ext. 2004 9am-5pm M-F PST. Notes: Will log any channel coming in from two independent CAN bus inputs. High resolution color LCD display. High brightness for sunlight readability. Type: Color TFT LCD, anti-reflective. Resolution: 800 x 480, anti-aliased graphics. Brightness: controlled via CAN message, 100 steps. 3 programmable 'pages' for Practice, Warm-Up and Race. 48 user-defined, scrollable message lines with programmable overrides. 10 color LEDs; color, function and intensity are fully programmable. Selectable fixed layouts, user programmable layouts minimum corner speeds, maximum straight speeds. Pre-wired with a terminated, plug-in loom. Can be mounted in the steering wheel using the optional Curly Cord. Curly Cord also provides the flexibility to add extra buttons. Compact unit with magnetic base. Pre-configured for use with MoTeC Display Loggers. Provides speed, position, lap timing, track mapping, date, time and more. 3-axis G Force Sensor +/- 5G. Alarm Ack switch on DIG1. Next Line switch on DIG2. 2 configurable CAN buses, with individually programmable CAN bus speeds. Operating voltage: 6 to 32 V DC. 5 V sensor supply: 0.25 amp maximum. 8 V sensor supply: 0.25 amp maximum. Internal: -4 deg F to 160 Deg F.
Above 140 F maximum backlight brightness progressively reduced. Typical maximum ambient temperature in free air: 130 Deg F.
Typical minimum ambient temperature in free air: -4 Deg F.
Several options are available as upgrades to customize and expand your system. Some of these additional features are activated through a simple password system, at any time when you need it. Upgrading a previously purchased MoTeC product? Click here. The Display Creator upgrade allows users to design custom graphics and screen layouts for display on the C125 screen, tailoring the look and functionality to a specific application. Designs can incorporate images, logos, icons, color themes and creative gauge ideas. The Display Creator software is free to download and experiment, but the upgrade must be enabled in order to send screen configurations to the device. Logging to a removable storage device. (flash drive) Requires 120 MB logging memory. The OBD-II loom is a plug-in adapter that connects the C125 terminated loom to the standard, on-board diagnostics port of many modern vehicles. This enables the C125 to display and log a selection of channels, which differs from car to car. Vehicle compatibility will vary from region to region, but as a guide most cars built after 2007 have an OBD-II connector. This upgrade activates the i2 Pro data analysis software. A i2 Feature License is also available. Provides access to advanced i2 Pro data analysis software with multiple graph overlays, X-Y plots, advanced math functions, synchronized video (automatic alignment), and flexible layouts to accommodate almost any user preference. This upgrade activates additional inputs and outputs for the wiring of sensors into the C125. 4 x 0 to 5.46 V.
2 x 0 to 15.0 V.
4 Low side outputs, PWM or switched operation. This professional quality, terminated loom provides the wiring for 6 analog voltage inputs and 2 analog temperature inputs. The 2 digital and 3 speed inputs are also wired into the button lead of the C125 terminated loom. The use of the 4 auxiliary outputs will require custom wiring. Upgrading a previously purchased MoTeC product. All Upgrade Option Codes for Motec Products are purchased based on the Serial Number of the product that is to be upgraded. The Serial number can be found printed on the product. Connect to the harness and use the Dash Mgr software to read the serial number. Select - Online | Enable Dash Options. You can also find the serial number by looking at the logged data file. Please provide the serial number when ordering the upgrade. Once we receive it the upgrade code will be emailed to you with in 24 hours M-F.
MoTeC prides itself on quality manufacturing and high reliability, and every effort is taken to ensure each product leaving the company meets the highest standards. To support this commitment, MoTeC provides a two year warranty on all MoTeC manufactured items.